On Friday, January 25th, a group of activists agreed to a settlement in TransCanada’s lawsuit against Tar Sands Blockade, Rising Tide North Texas, Rising Tide North America, and nineteen individuals. The SLAPP suit (Strategic Lawsuit Against Public Participation) alleged that direct action against Keystone XL has cost TransCanada $5 million. This contradicts frequent public statements by TransCanada’s spokespeople that blockaders were not impeding construction in any meaningful way. The eight Texans who came to court to defend themselves on Friday, some of whom had not been actively involved with Tar Sands Blockade since protests in August, were threatened with losing their homes and life’s savings if the lawsuit went forward. In order to protect the livelihoods and dependents of brave activists like Tammie Carson, who locked herself to a truck carrying Keystone XL pipe, the activists agreed to settle the lawsuit. The corporation will not seek the $5 million in financial damages, and the named defendants and organizations agreed to not trespass on Keystone XL property in Texas and Oklahoma or face additional charges. Despite this legal setback, members of Tar Sands Blockade are as determined as ever to stop Keystone XL. The sustained direct action campaign will continue. Here’s a chronology of all the direct actions taken since August 2012. “The SLAPP suit (Strategic Lawsuit Against Public Participation) filed against the people and organizations that are fighting against TransCanada’s unethical and environmentally destructive pipeline will never stop the people’s resistance to the XL Pipeline. 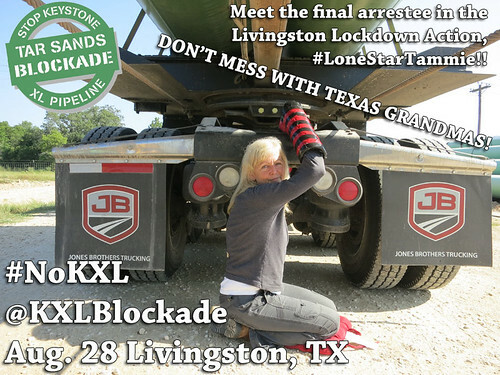 TransCanada has repeatedly attempted to violate the law and bully the people of Texas: through corporate corruption and lies, they obtained “common carrier” status in Texas in order to steal private property from low income and hard working Texans; they have attempted to bring the full weight of the police state upon nonviolent activists in an attempt to crush their peaceful resistance–using mace, tasers, and physical brutality.